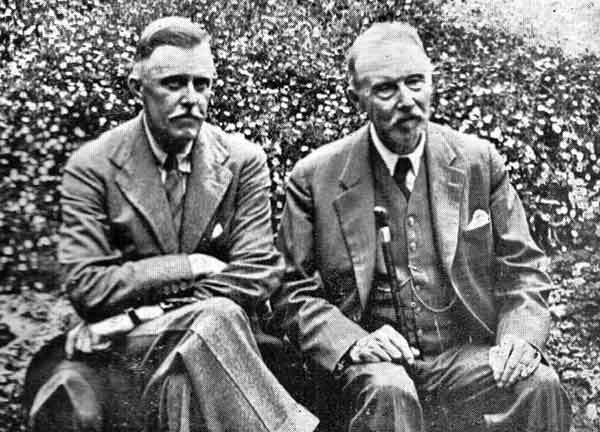 Athelstan John Laurie Riley (1858-1945) was one of the leading lay members of the Ritualist Movement in the Church of England in the late nineteenth and early twentieth century. The son of a successful London lawyer and the grandson of a Yorkshire railway speculator, he inherited a large fortune and consequently never had to work for a living. He was able to devote his long life to his interests, which were primarily focused on the revival of ‘medievalist’ liturgy and aesthetics within the Church of England. He was a significant scholar and a major patron of the arts. It might seem a little odd to those who are outside the Church of England, but by the 1890's the ‘Anglo-Catholic’ or ‘Ritualist’ movement as it had become known, had split into two streams each with a distinctive vision. The first stream known as the ‘English Use’ or 'Sarum', was staunchly wedded to the Book of Common Prayer and it looked back to the Middle Ages and to the Use of Sarum for the ritual and visual embellishment of the Anglican Prayer Book. The other stream the 'Western Rite' looked towards the contemporary Catholic Church for inspiration and had a distinctly Rococo and Baroque aesthetic. Athelstan Riley’s own liturgical and aesthetic predilection was for the ‘English Use’ and he was one of the founder members, along with Sir Ninian Comper, of the Alcuin Club established to promote its principles. Today Athelstan Riley is best known not as a leading liturgical innovator, but as a hymn writer, contributing such classics as ‘Ye Watchers and ye Holy Ones’ and ‘Christ the fair glory of the holy angels’ to the English Hymnal, the hymnal produced by Percy Dearmer, the chief proponent of the ‘English Use’. 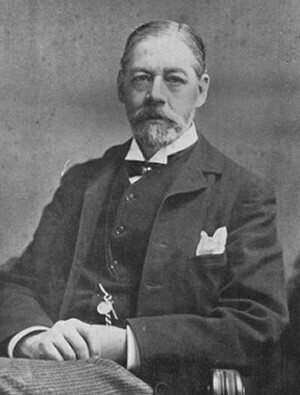 T. G. Jackson, the architect of 2 Kensington Court. In 1883 Riley was a twenty five year old bachelor, he had just graduated from Oxford and was already an avowed medievalist. He purchased some land opposite Kensington Gardens in central London and set about constructing a new house for himself, a house that in time became known as Number 2 Kensington Court. He would pour all of his aesthetic and religious principles into this house. The architect Riley chose for the work was the established Oxford Gothic-Revivalist T. G. Jackson, the architect of the Oxford Examination Schools, which Riley would have known well as an undergraduate at Oxford. 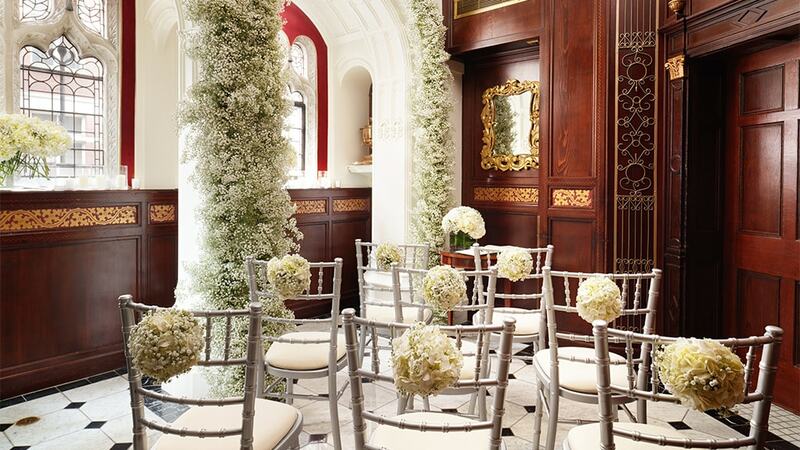 2 Kensington Court occupies a corner site opposite Kensington Gardens and Kensington Palace. Like many of his generation, Riley’s aesthetic sensibilities were focused like those of the previous generation on thirteenth and fourteenth century gothic, but more towards the decorative northern European Gothic of the fifteenth and early sixteenth century. The quirky house Jackson designed for Riley was a large red brick structure influenced by Flemish houses of the 15th and 16th century, with something of an Arts and Crafts twist. 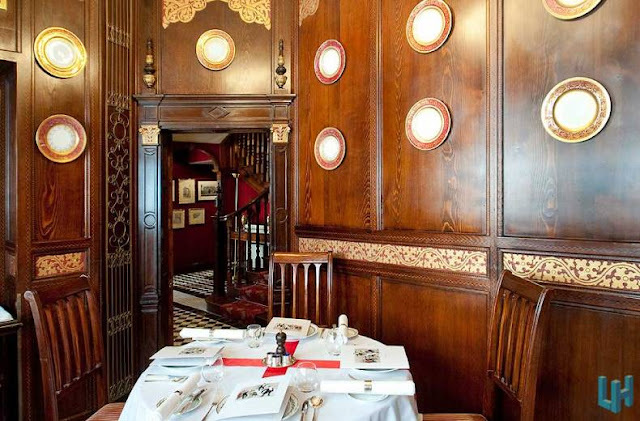 Money was no object for Riley and the building was lavishly decorated with stringcourses bearing Riley’s initials, Terracotta panels made by Doulton with his coat of arms and William de Morgan tiles. The ground plan of 2 Kensington Court, showing the Oratory leading off the stair hall. The ground plan of the house nods in the direction of houses constructed by A. W. N. Pugin a generation before. Like Pugin, Riley was keen to incorporate into his new house an Oratory. 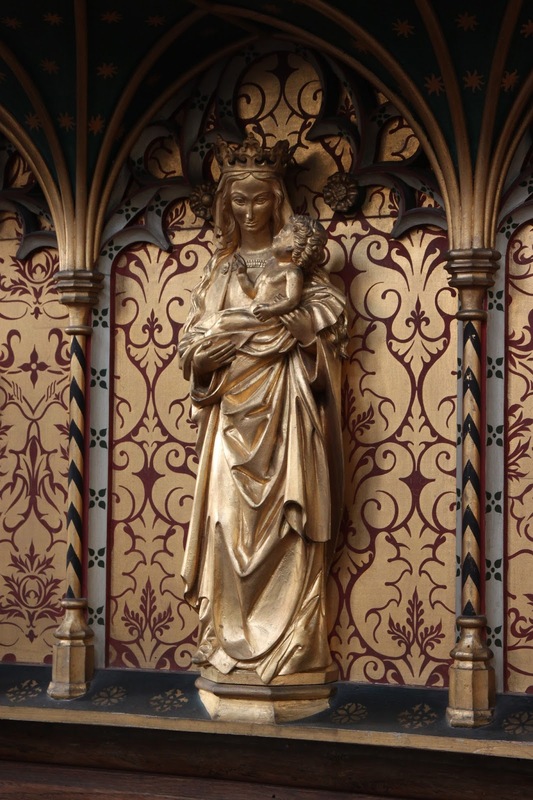 The Oratory in 2 Kensington Court was placed at the heart of the house, on the ground floor just off the main staircase hall, between Riley's Library and Study and the Dining Room. The Oratory is small space lit by two west facing windows and is divided by a two bay arcade that create a sort of narrow ante-chapel or aisle, the arches panelled in an East Anglican Perpendicular style. In 1887 Riley had the Oratory panelled out with cedar panelling by C. E. Kempe the stained glass designer. The panelling is broken up by a Gothic dado and incorporates Arabesque panels and Jacobean revival doorcases. 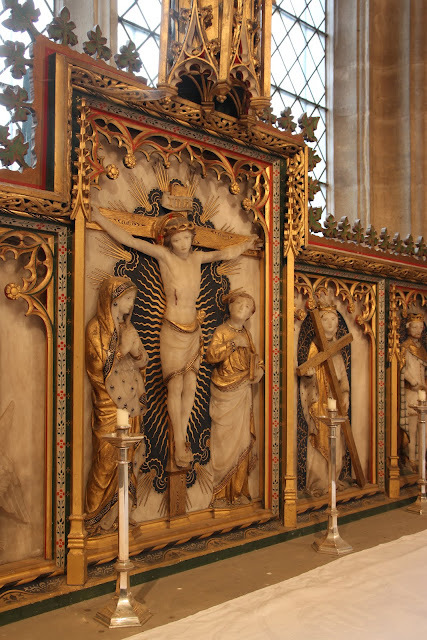 In 1895 a recess was let into the panelling in the east wall for a new altarpiece and altar commissioned from the young and up-and-coming designer Ninian Comper. 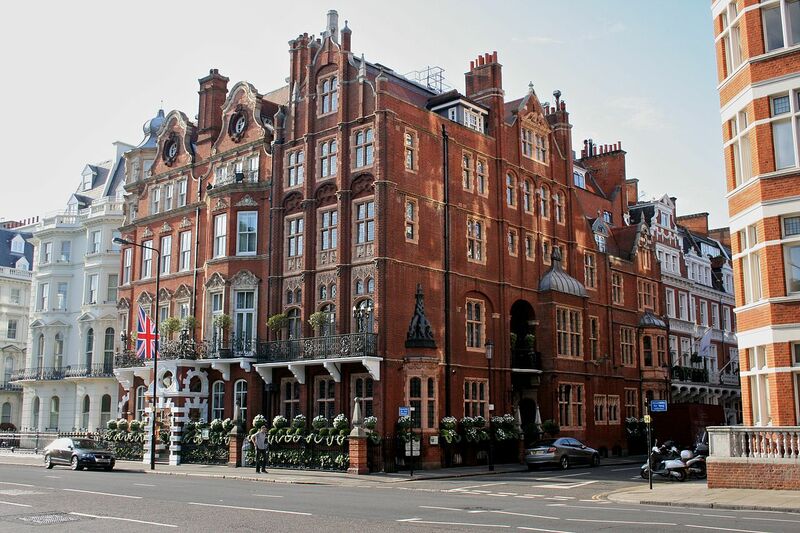 Sadly 2 Kensington Court is no longer a private house, but is part of a five star hotel called the ‘Milestone'. 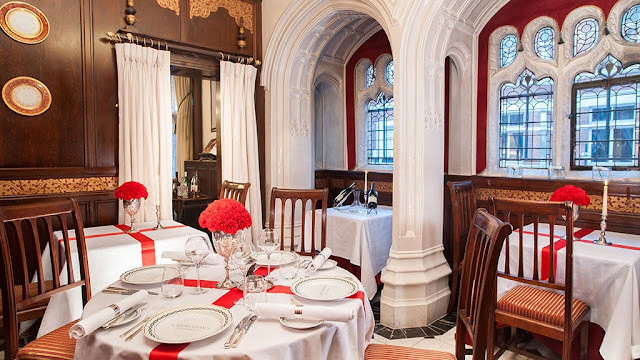 Riley’s little oratory, with its Kempe panelling is still intact, but it now forms part of the hotel’s dining room. 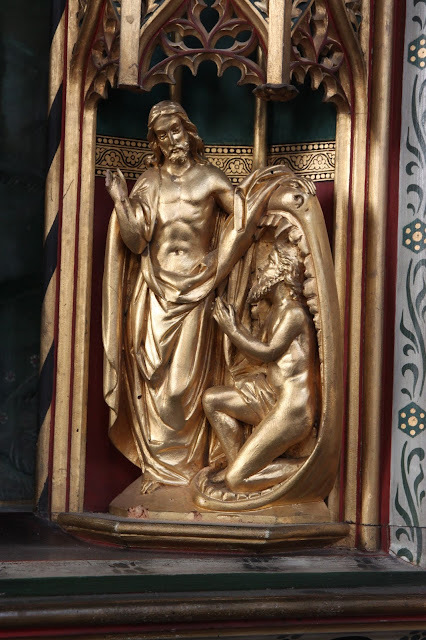 The altarpiece that Comper created for this space, can now to be found in an out-of-the-way country church in Suffolk. Having been removed from 2 Kensington Court in 1905, it remained in the Riley family until given to Cavendish church in 1950 by Morwenna Brockleban, Riley’s daughter. Sadly it is rather divorced now from any liturgical context and is simply a decorative feature set against the north nave wall. It is nonetheless and extraordinary and interesting early piece by Comper and it's influence can be seen in his later and more mature work. 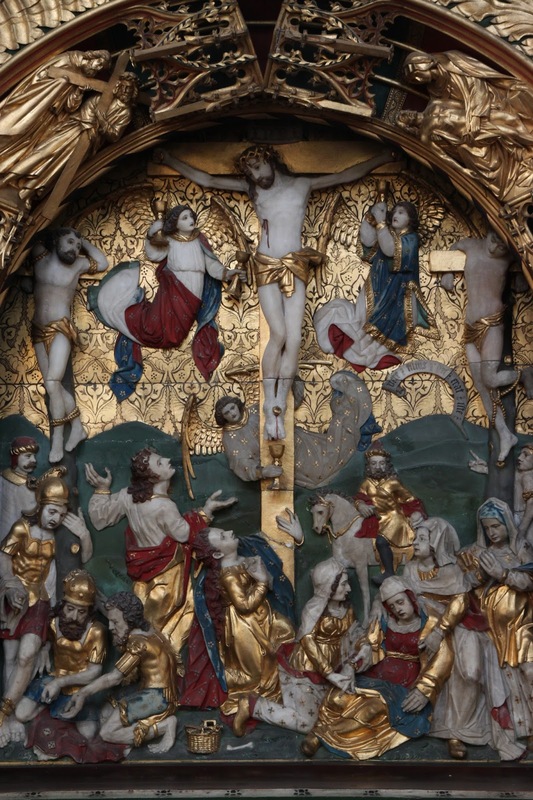 The central panel of the altarpiece is a crowded Crucifixion scene. The lower two thirds of this are formed from a fragment of a Flemish seventeenth century alabaster panel. The upper third is Comper's own reconstruction. 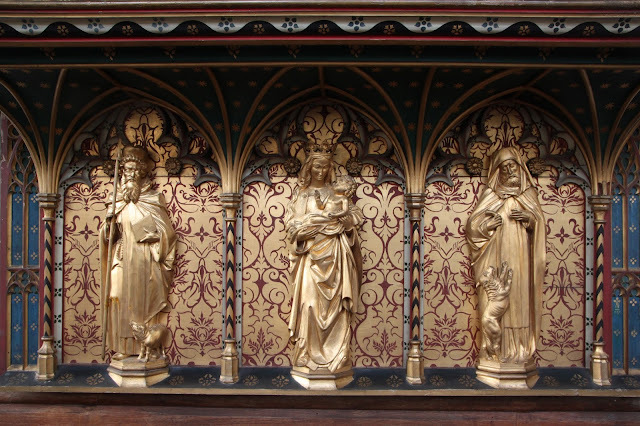 The rich polychromy and the gilded damask backdrop to the scene, are most probably Comper's work and reflect the colour palette used by his master Bodley in much of his work. What is striking is that the white of the alabaster is left uncoloured where flesh is depicted. The central panel is encased within an elaborate canopied frame, entirely Comper's work. 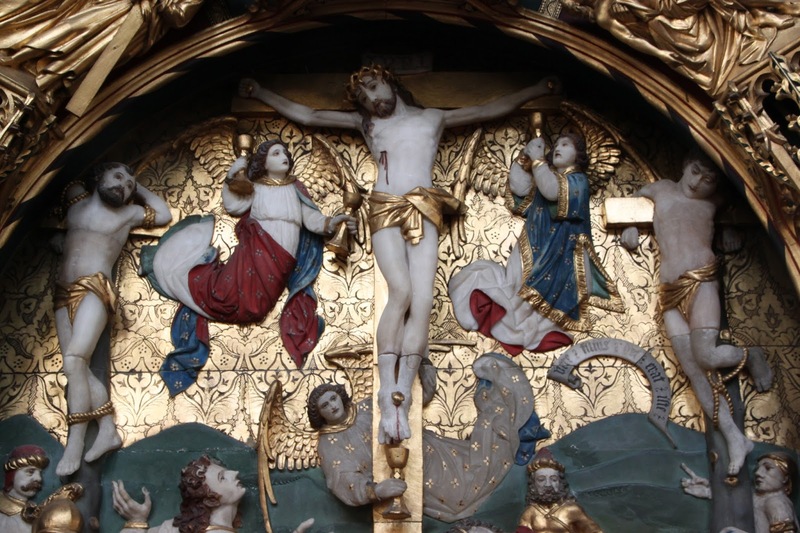 An arch frames the central action and it is turn is decorated with scenes under canopies: Ecce Homo, Christ and Veronica, Christ and Simon of Cyrene, a Pieta, the Resurrected Christ and the Magdalene and the Harrowing of Hell. In the spandrels on either side are the coat of arms of Athelstan Riley. In 1887 Rikey had married Andalusia, the daughter of the 8th Earl of Molesworth, a peer and clergyman. The arms of Riley impaling Molesworth appear, along with Riley alone. All this is bordered with decoration that is quite clearly derived from East Anglican screen paintings of the fifteenth century. Capping the whole reredos is a projecting canopy, which is coved and has a traceried front. 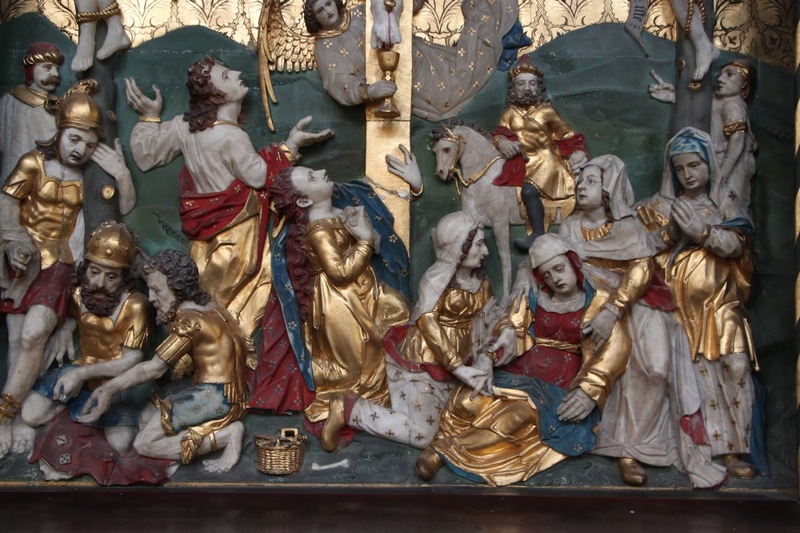 At the base of the reredos the the main panel is supported by a recessed predella with three compartments. More coving again, which forms a little canopy for three gilded figures. In the centre a Madonna and Child and to the left two male saints, to the left St Anthony and to the right St Jerome. These are set against a ground of fictive damask. Number Two Kensington Gardens was very much an expression of the taste of Athelstan Riley, it's blending of Flemish inspired Gothic, with the modern Arts and Crafts movement, English Renaissance and Arabesque decoration, was a realisation of his dream aesthetic. In his Oratory, an intimate devotional space within this house, you perhaps saw that aesthetic most concentrated. 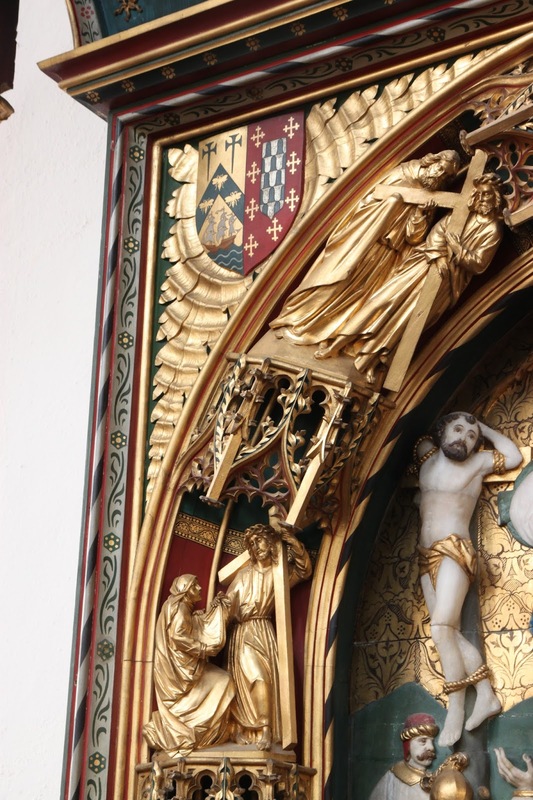 A tiny chapel, inspired by English Perpendicular architecture, incorporating English Renaissance detailing and as it's primary focus a Flemish Renaissance panel, recoloured and framed in a reredos that blended northern European and English Gothic motifs. What Riley was presenting here in his own Oratory was what Comper would in his mature years come to call 'Unity by Inclusion'. Perhaps in this early work in this domestic setting, you see the very origin of Comper's later thinking. The production of this altarpiece for Athelstan Riley would have a long-lasting impression on Ninian Comper's church work. The bright polychromy applied to the creamy white alabaster of the seventeenth century panel, clearly had an influence and time and time again he would produce his own alabaster reredoses that were similarly treated. On the life of Athelstan Riley see: M. Yelton, Outposts of the Faith (Norwich, 2009), pp. 51-81. On Kensington Court: 'Colby Court, Kensington House and Kensington Court', in Survey of London: Volume 42, Kensington Square To Earl's Court, ed. Hermione Hobhouse (London, 1986), pp. 55-76.